An investigative story published by the newspaper Folha de S. Paulo today proves that companies are paying for WhatsApp bulk messaging services to spread fake news and attack ads against the Workers’ Party (PT). According to the article, companies are planning a big operation for the week before the runoff election in Brazil, which will be held on Oct. 28. The companies are supporting the far-right candidate Jair Bolsonaro and using lists of mobile contacts sold by digital strategy agencies and also the presidential hopeful’s own database. The law, however, only allows candidates to use their own lists of contacts provided voluntarily by individuals. To send hundreds of millions of messages, contracts are worth as high as R$12 million (more than US$3.2 million). One of the companies hiring these services is Havan, owned by Luciano Hang, who has reportedly been forcing his employees to vote for Jair Bolsonaro. Hiring this kind of services can be considered illegal campaign contributions from corporations if they are proven to have links with the Social Liberal Party candidate. João Meira, who holds a master’s degree in Political Law, explains that the elections could be annulled due to illegal campaign practices and abuse of economic power. Meira argues that, with a fierce WhatsApp campaign and the “industry of lies” established around it, it is virtually impossible to control what kind of content is shared and, if the accusations are proven true, “the fraud completely taints the election process.” “If Bolsonaro and his campaign are proven to be associated with the actions of those groups of people who committed unlawful acts, even if he is elected, he can be impeached and be ineligible to run for eight years,” the expert says. While some of the agencies reported to be sending mass WhatsApp messages include Quickmobile, Yacows, Croc Services, and SMS Market, Bolsonaro’s financial disclosures only include the company AM4 Brasil Inteligência Digital, which was paid R$115,000 (nearly US$31,000) to provide digital media services. According to Folha, the services are between R$0.08 and R$0.12 (US$0.02-0.03) per message sent to contact numbers from the candidate’s own list and R$0.30 to R$0.40 (US$0.08-0.11) per message when the list of contacts is provided by the agency. The agencies also offer segmentation by region and even income. Folha reported that one of the strategies used by Bolsonaro’s campaign is automatically generating foreign phone numbers through websites such as TextNow. The article also mentions that the contact databases are often provided illegally by debt collection companies or employees who work at phone companies. Using international calling codes, the administrators can dodge spam filters and restrictions imposed by WhatsApp, such as the limit of 256 members in a group or automatically sharing a message to no more than 20 people or groups. The Workers’ Party candidate, Fernando Haddad, has been the primary target of fake news shared through WhatsApp in the 2018 elections. 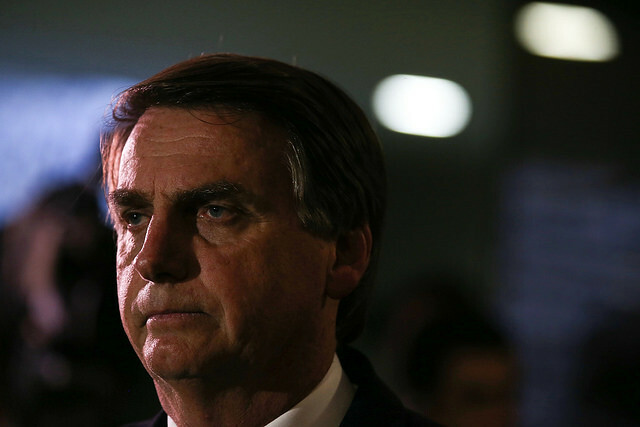 The presidential hopeful said he will file complaints against the accused companies, arguing the episode shows, once again, that Bolsonaro does not respect democracy. “We are going to ask the electoral court and the Federal Police to immediately arrest these corrupt businesspeople in order to stop [them from sending] these WhatsApp messages. They have names of owners, names of companies, contracts, the amount of slush funds – which is an election offense. He [Bolsonaro] is dodging [the presidential] debates, but he cannot dodge justice,” Haddad said. “It’s a consorted action to influence the electoral process that the electoral courts cannot overlook or leave unpunished. We are taking all legal measures so that he is held accountable for his crimes, including using slush funds, because the millions spent on the industry of lies are not included in his financial disclosures,” the statement reads. “Congressman Jair Bolsonaro’s criminal methods cannot be tolerated in a democracy. The Brazilian authorities have a duty to make sure the election process runs smoothly. Social media companies cannot just passively watch their services being used to spread lies and offenses and become accomplices in the manipulation of millions of users,” the party wrote. Havan did not immediately respond to a request for comment.